I'm not quite sure how I've ended up at the Christmas markets in Bath, I wanted to go to the ones in Vienna! Actually I do know, the times of the flights were dreadful, and the attributable costs seemed rather extreme to what would equate to 48 hours in Vienna, so having heard good reports about Bath, I found a charming and cheap cottage to rent in a nearby village! 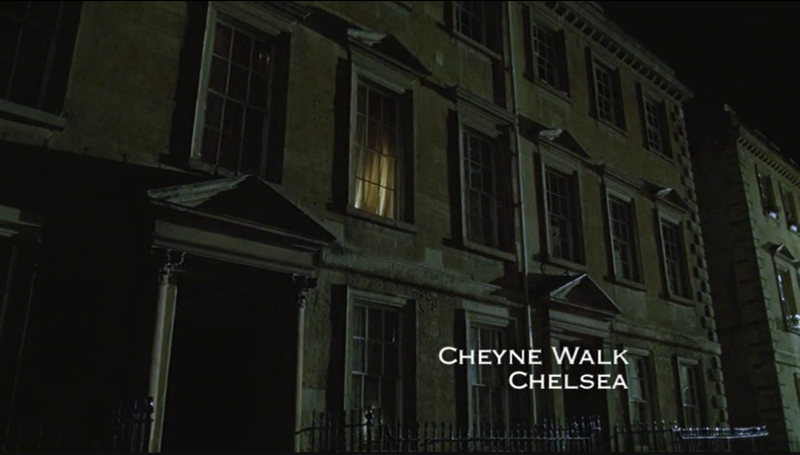 Once I had located and photographed the area in daylight, I decided I had better check out Bath, and maybe come back later for pictures in the dark to echo one of the scenes in the film! 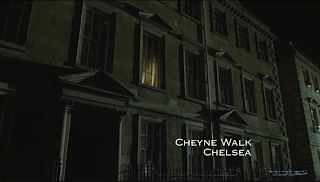 Now I'm not going to ruin an article I have not yet written by putting on here all the details of my research, but suffice to say there is at least one scene filmed in Bath! and Bath has one of the best fashion museums in the country. I popped along hoping for a quick look around, but upon arrival I was told if I wanted to wait 5 mins there would be a guided tour. Imagine my surprise when I found I was the only one on the tour! Tracy, my guide, explained about their current exhibit in great detail. It was Georgian fashion, but the most surprising thing I realised was that clothing is not just pretty bits of fabric, it is a social commentary of the time. It is possibly the most interesting tour I have been on as I was able to chat to Tracy and discuss what she was saying, rather than it being a dry "this is what this dress was for" "this is a frock coat" quick walk around the exhibits. I was able to discuss the changes in society when George I came to the throne from Hanover in Germany. 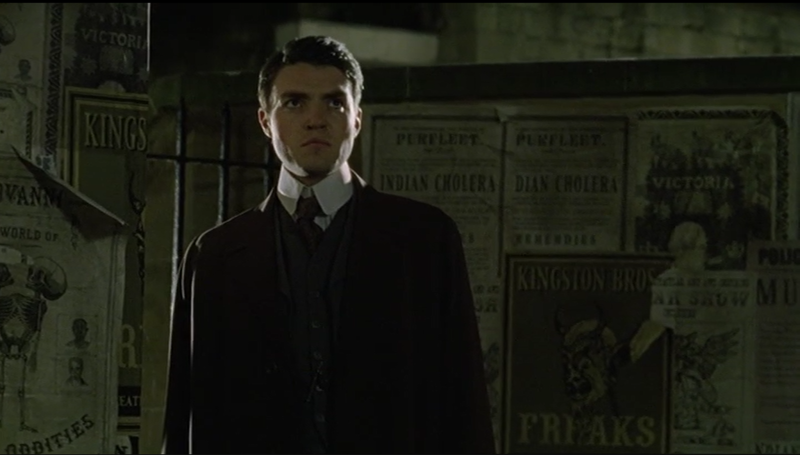 It was a major turning point in British society. If you had a trade you could make something of yourself, it did not matter if you started off poor, and this was reflected in the clothing of the day. There was a beautiful yellow embroidered dress at the beginning of the exhibition, and this dress belonged to a merchant's daughter, not a member of nobility. There were about 30 dresses in this exhibit, gowns were made of richly embroidered fabric, and a man's court coat was embroidered with silver thread which has tarnished with age, but you could imagine how it would sparkle under the lights in the King's court, making the wearer something of a focal point! We think of 'planning' our wardrobe, but this was nothing in comparison to Georgian society. Cloth would be woven into intricate designs, and people would buy this fabric and store it for years until the right event happened for the cloth to be made into some spectacular garment. It took teams of people to work on each dress, each person having their own skill, from pattern cutters, to sewers, to embroiderers. Whilst a client may have held onto their fabric for years, once a garment was required they wanted it quickly and were not prepared to wait for more than a few weeks! We consider the rags to riches stories to be a modern day phenomenon, but it's not. The Georgians created this attitude of bettering yourself, history then took a backward step for a time, until once again, society dictated you could be anything you wanted to be! 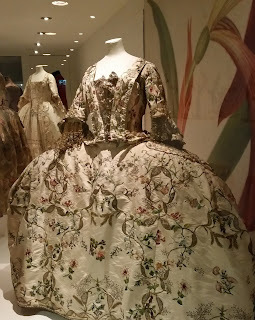 The exhibit also contained three stunning court dresses, or Mantua's, again the hand embroidered garments were amazing, and the attention to detail is something to behold. Flowers were not generic shapes, they were recognisable as roses, honeysuckle etc, and different coloured thread were used to create a three dimensional effect, as though it were a painting of a flower, not just some stitching. There were only about 30 families of nobility in the Georgian era who would be attending court, balls and various functions. 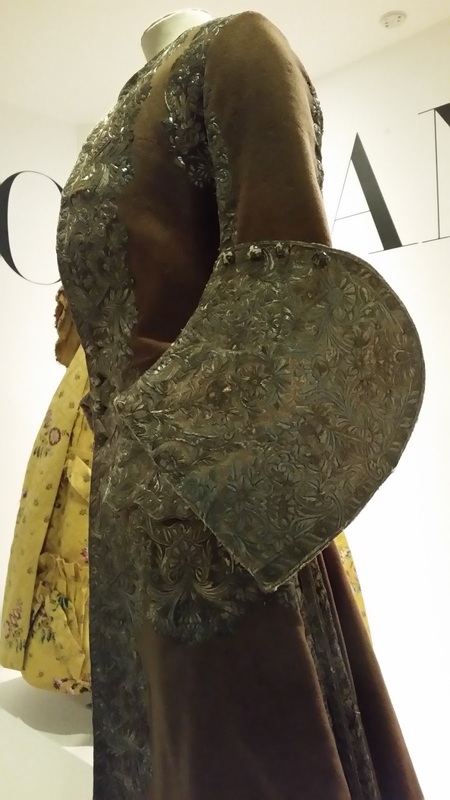 Each function would require a new dress, and each dress had to be elaborate to show the wearers standing in society. We then moved onto the Regency period. In France there had been the French Revolution, and in some ways society started to breakdown and even go backwards a little. Fashion became a lot less elaborate, but the simple shift style garments caused more provocation than the heavily stylised dresses of the Georgian court. 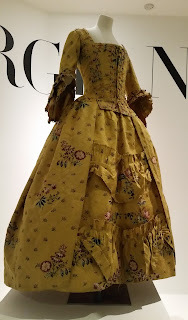 The court dresses were worn over corsets and panniers or hooped skirts. 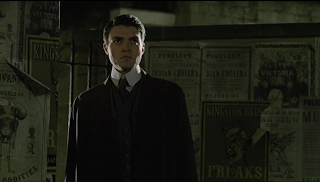 The female form could not be seen, it was moulded into the ideal shape of the day. 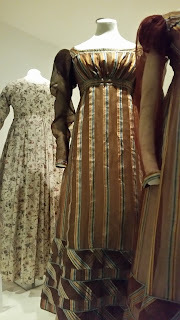 The simple dresses of the Regency were worn over simple undergarments, and the fabrics were light and floated along the lines of the female form. It is said that many women would deliberately get wet so that their clothes clung tantalisingly to them! Society had changed a great deal! Tracy left me after our brief voyage through history, and I continued though the museum to look at the other exhibition Great Names of Fashion. Here you could see evening dresses by some of the greatest names of 20th century fashion, Christian Dior, Elsa Schiaparelli, Yves St Laurent and Balenciaga. By the time I left the exhibition it was dark enough for some atmospheric shots so I wandered back through the Christmas market stalls (yes I did squeeze them in!) and tried to recreate a couple of shots in the pouring rain! Then it was time for mulled wine, hot chestnuts, and back home to a warm, dry cottage!